As hot as it was Saturday afternoon, it didn't stop people from spending the day at the Charleston Farmer's Market. Ranked by Travel + Leisure Magazine as one of the best farmers markets in the U.S., it features vendors and farmers scattered around Marion Square. You've heard: "There's an app for that"; well at the Charleston Farmer's Market: "There's a vendor for that". Fresh fruit and veggies, check. Handmade purses, check. Fresh crab dip, check. Handmade arts and crafts, check. Read more stories on this subject in our Spoleto and Piccolo Spoleto topic page.For guests of Spoleto and Piccolo Spoleto, the farmers market is perfect for a lunchtime spot. This is no fair food, where you're limited to funnel cakes and oversized chicken legs. Here you'll find some of the best local Charleston cuisine on display. 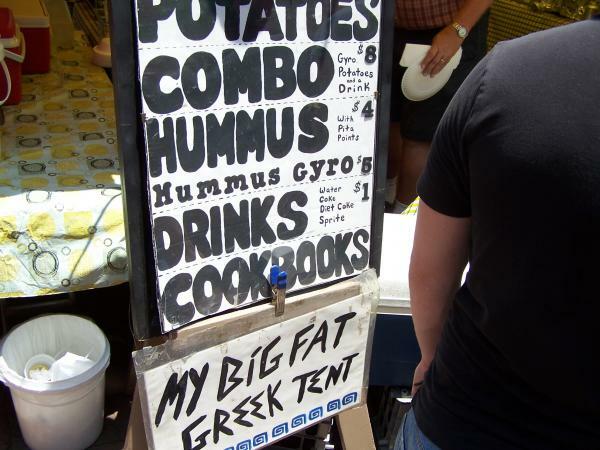 One of the market's favorites, which was demonstrated by the long line stretching down the sidewalk, is My Big Fat Greek Tent. Here you'll find freshly made Pork, Chicken and Lamb Gyros, as well as greek potatoes and hummus. Saturday also featured various Piccolo Spoleto events throughout the day. There were several music and dance performances during the afternoon, as well as the Instrumental Petting Zoo, which was a part of the Piccolo Spoleto Children's Festival. Events continue at Marion Square throughout the festival.